Well, it has been a fantastic tour so far. Sadly, we are on the final furlong now. 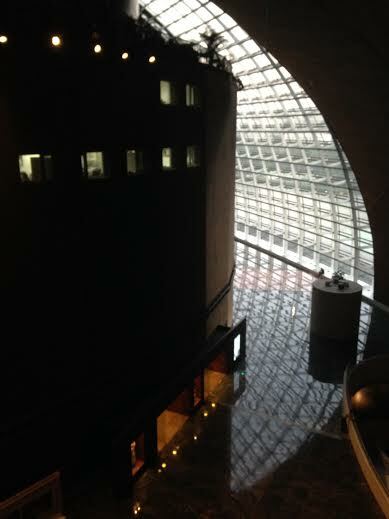 Two days in Beijing, with with two concert performances at the amazing National Centre for the Performing Arts. We had been informed that these two gigs, being in the Capital City and attended by certain people etc would be the most important for the orchestra. Although, for the life of me, as a professional musician, I can’t see that any concert would be less important than any other from a musicians point of view! 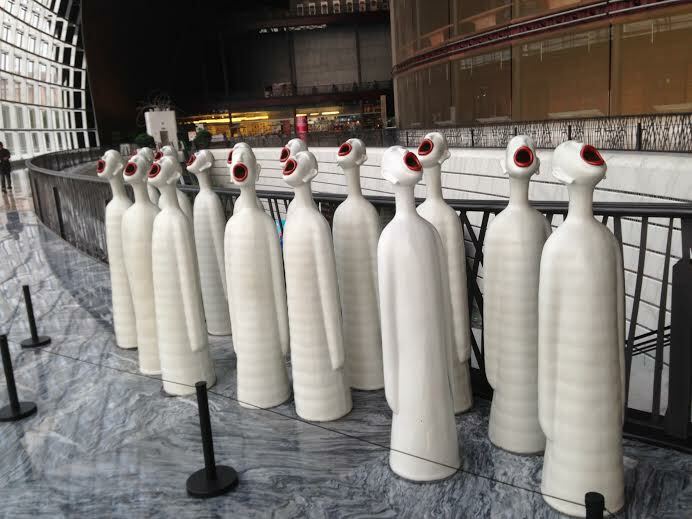 My colleagues and I always try our best whatever the performance. I think all professional musicians do. That is not to say that all performances always go perfectly by any means, only that the intention at the outset is to try our best, no matter how tired players are or if some are feeling a bit off colour etc. 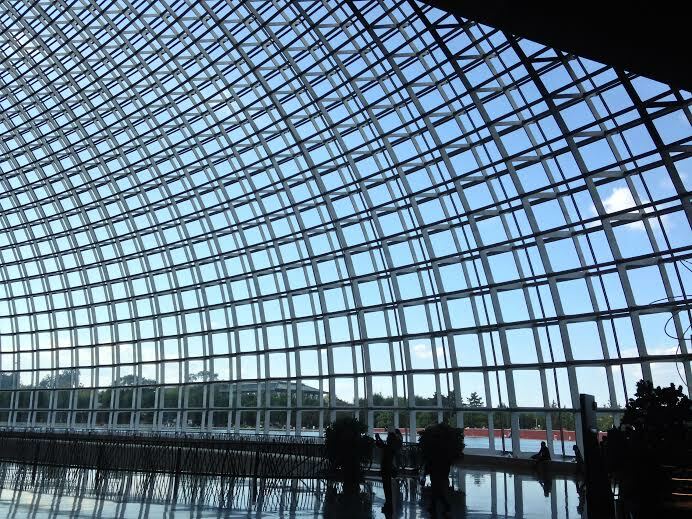 The National Centre for the Performing Arts is indeed a treat. 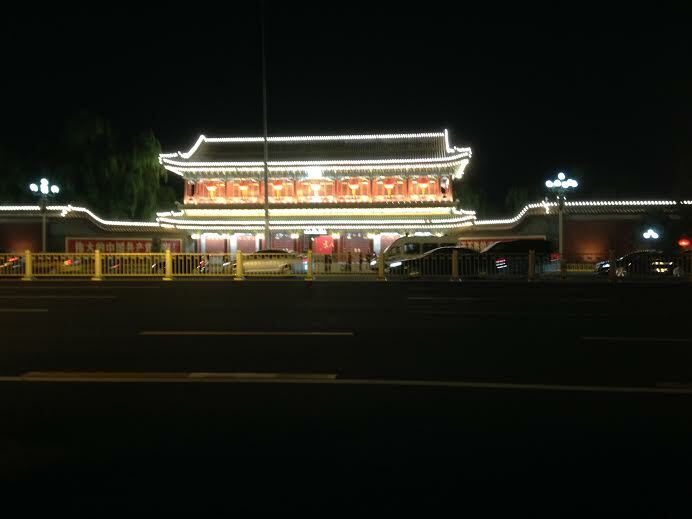 It is housed next to the Great Hall of the People, which just go to emphasise the significance that China places on the importance of arts and culture for the citizens. The weather was beautiful, as you can see. It is such a pleasure to come to work in such fantastic surroundings. Of course, The Egg is not just a pretty face. 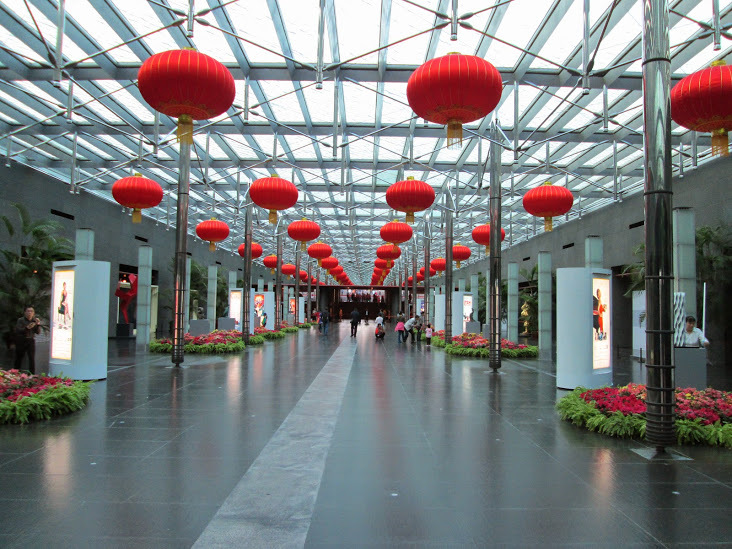 It houses a state -of-the-art concert hall and a world class opera theatre. 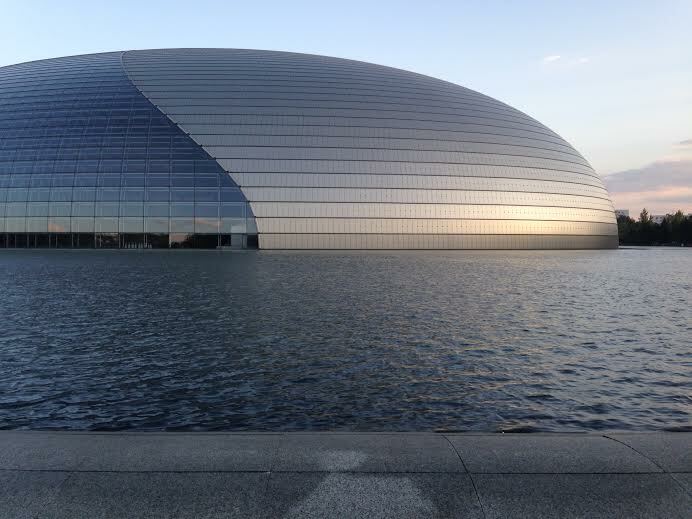 The ‘Egg’, as the centre is affectionately known by the Chinese, is surrounded by a man made lake. 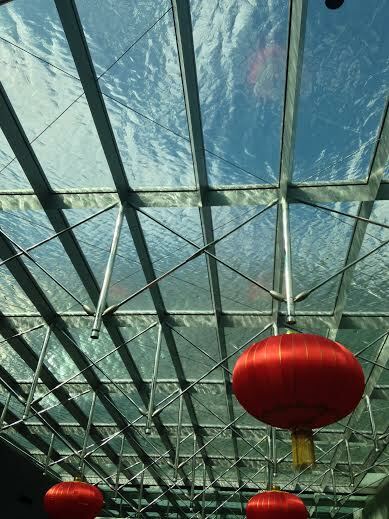 What a surprise to find the entrance lobby runs directly below this lake and uses the water as an impressive feature on the ceiling. The concert room itself looked amazing. 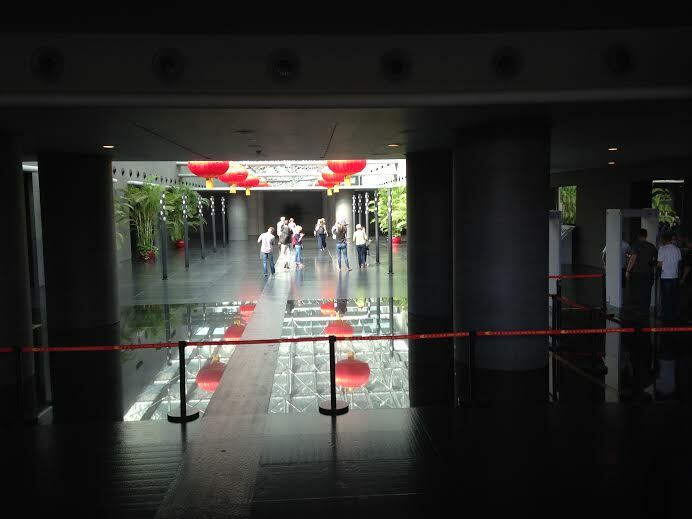 We have come to expect this in China but the venues have been as good as any in the world. 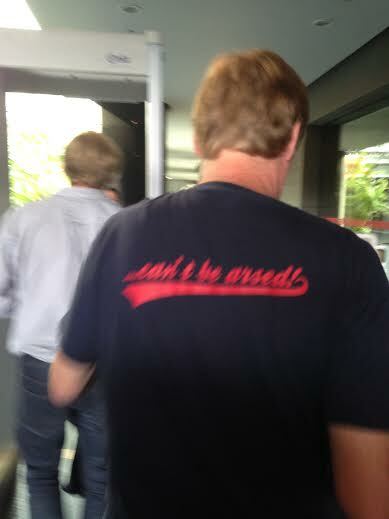 This was no exception. 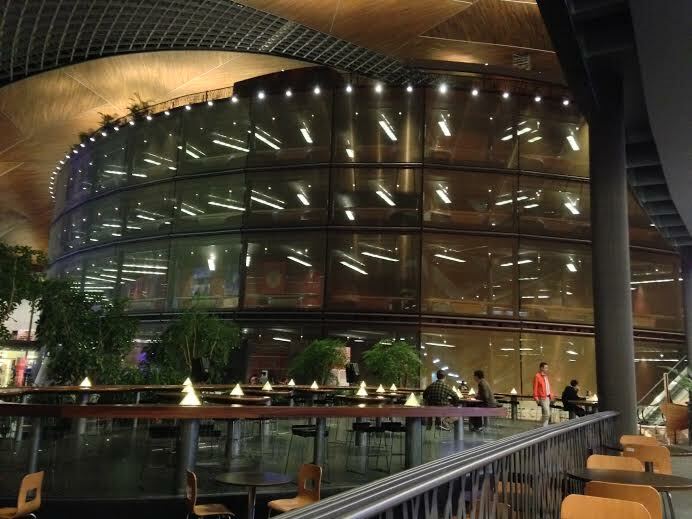 It was acoustically and aesthetically brilliant, in my view. 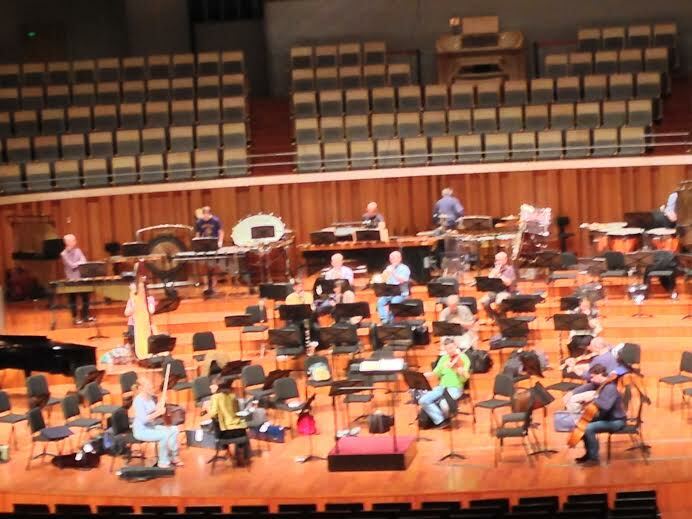 We would be performing the new percussion concerto by Stewart Copeland in Beijing. Entiltled ‘Poltroons In Paradise’, the RLPO had recently given the world premiere of this work in Liverpool. 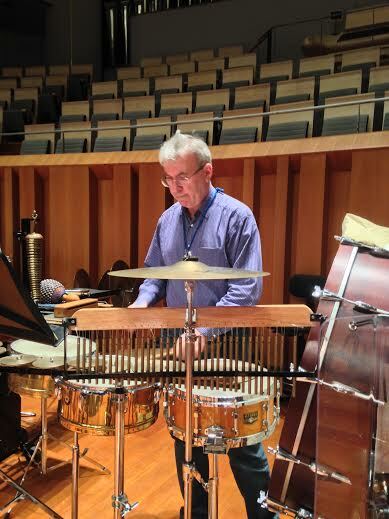 Our soloists are Graham Johns (RLPO Percussion Section Leader, pictured), Henry Baldwin, Aidy Spillet and Neil Hitt. 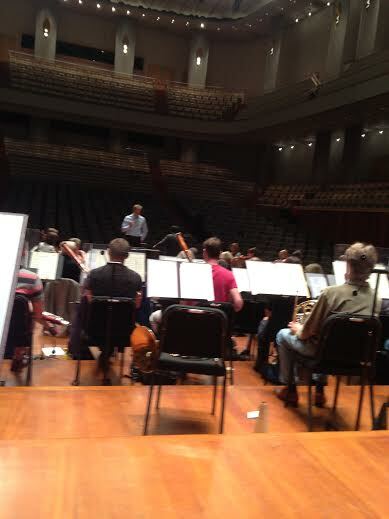 The Concerto has become a particular favourite of the trumpet section. 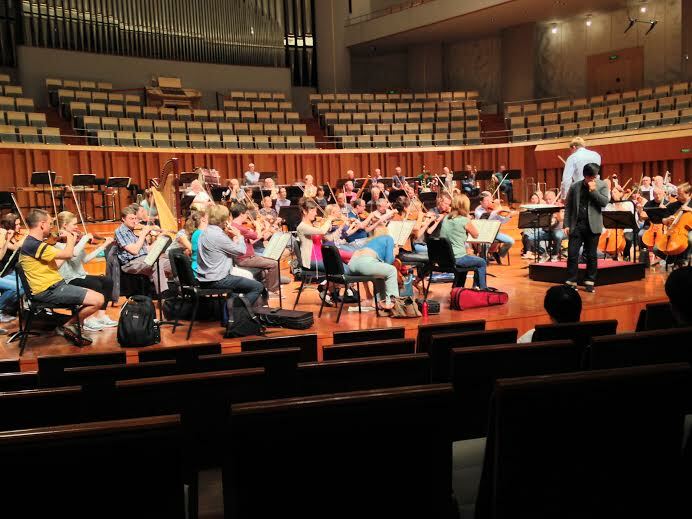 Those who have already read the previous ‘China Blogs’ I have posted will know that the RLPO are playing two distinct programmes on this tour. The first concert consists of what I have been referring to as programme A. 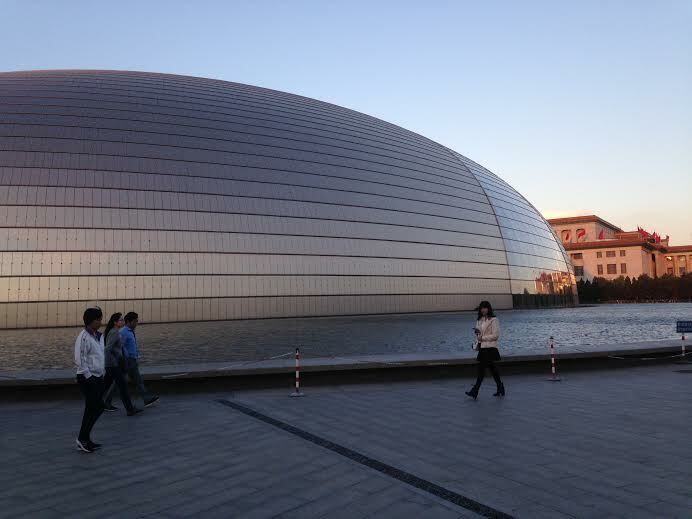 This would comprise the first evening show in Beijing minus Tannhauser Overture. The first half was Tchaikovsky Capriccio Italien followed by the Glazounov Violin Concerto. 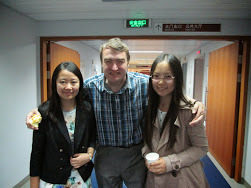 Our violin soloist for the tour was Chinese National Ning Feng. Following the Glazounov the audience had demanded an encore from Ning Feng each performance. 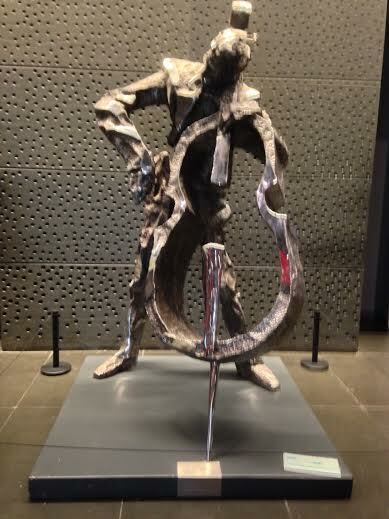 On this tour he offered a different piece by Paganini each time, including the variations on God Save The King. Tannhauser would be substituted in the second half by Poltroons in Paradise. The final piece in the second half was Rachmaninov Symphonic Dances. Our second programme was designed to be more of a pot pourri of slightly lighter classics. Programme be consisted of Shostakovich Festive Overture – quite a show piece for the trumpets: Debussy Rhapsody for Alto Sax & Orchestra; a Suite form The Nutcracker and for the first and only time on the tour, an appearance be the Chinese Superstar tenor Yijie Shi, singing the big arias from Donizetti L’Elisir D’Amore and DonPasquale (also a showcase for RLPO Trumpet Section Leader Rhys Owens. The second half began with Sibelius Finlandia, followed by Faure Pavane before another appearance by Yijie Shi, this time singing the pot boilers from Rigoletto. This most pleasing of programmes would officially conclude with the Polovtsian Dances from Prince Igor by Borodin. 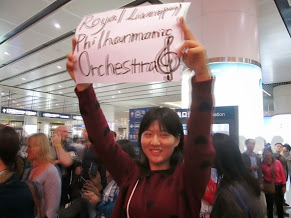 The RLPO had set off for China intending to ‘encore’ if necessary with The Chinese Dance and The Russian Dance from The Nutcracker. We still used them but had been following them after the first concert with a symphonic arrangement of ‘China My Beloved Country’ (at least, I think that is its name, apologies for not knowing for sure!). Once the audiences had recognised what we were playing, after the first few seconds (!) they went wild each time; clapping, singing and cheering! Often, particularly in programmes which include a lot of smaller pieces, trumpeters (and cornet players, of course!) will find it more convenient to use more than one trumpet. This had been instilled in me as a student at the Royal College of Music by Professor Michael Laird. He considered it a waste of time and money buying more than one trumpet if the player was never going to use all of them! The reason for using more than one maybe to transpose the music into easier keys or to pitch the music into a more convenient register (not too high or low for comfort. I had brought four on this tour. 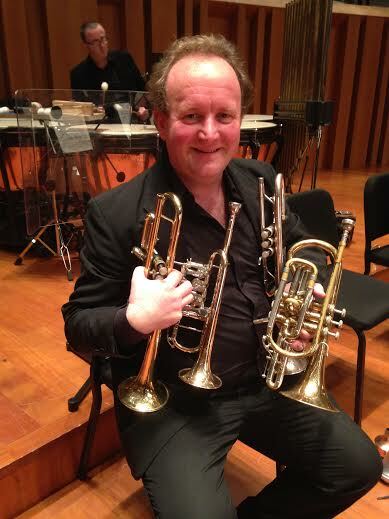 Tchaikovsky insisted on two cornets and two trumpets for Capriccio Italien so I had my trusty old cornet, which used to be one of many instruments owned by the great trumpeter John Wilbraham. I had my ‘regular’ B flat trumpet. I prefer playing the C trumpet when I play first these days so I had my C for that purpose and a piccolo trumpet for the Copeland Percussion Concerto. It’s getting so I can’t come on stage and shake hands anymore! 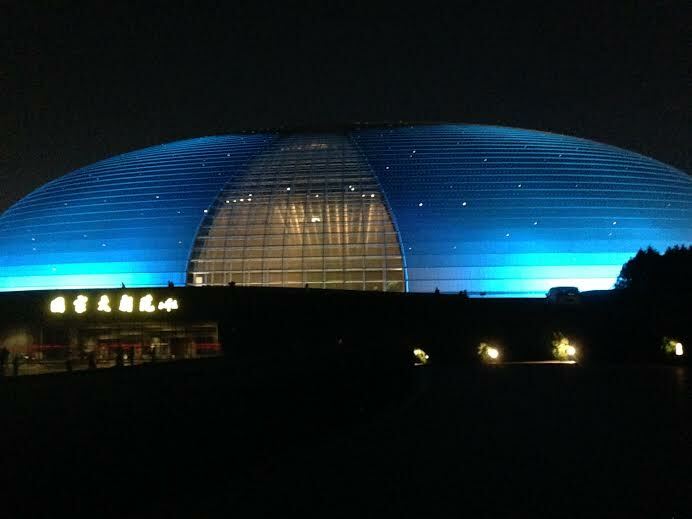 This was the spectacular sight which greeted concert goers as they arrived at the National Centre for the Performing Arts in Beijing. Wonderful stuff! 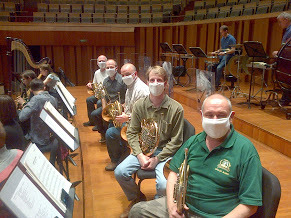 This is the Royal Liverpool Philharmonic Orchestra low heavy brass section. We have three trombonists called Simon and a tuba player called Robin, so guess which one is the odd one out! 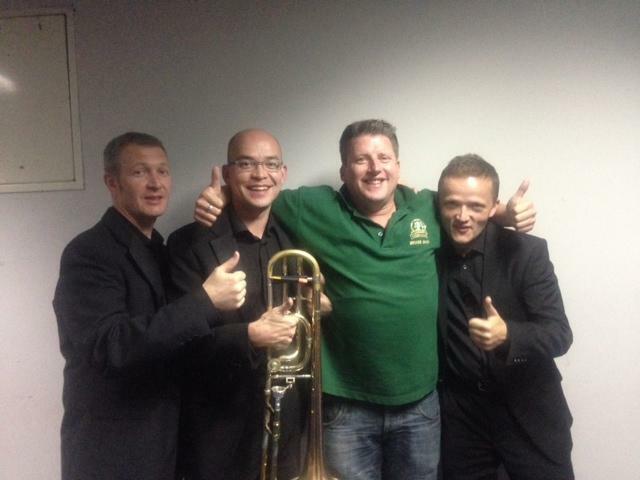 From left to right: Principal Bass Trombone, Simon Chappell; Principal Second Trombone, Simon Powell: Section Leader, Simon Cowen and Principal Tuba, Robin Haggart. 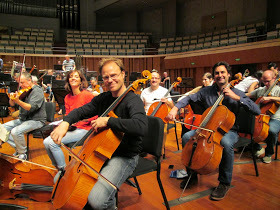 Note they are all ready to play in tour concert dress except the boss, Simon Cowen. Simon is a keen brass bandsman and it is becoming extremely difficult to get him out of his Greenalls Brass Band T-shirt, which has become like a second skin to Simon. 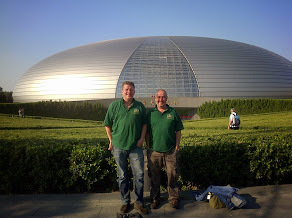 He and one of our French Horn section, Chris Morley are both members of Greenalls Band and can be sigh sporting their official band merchandise in many photos on the RLPO China Blogs. 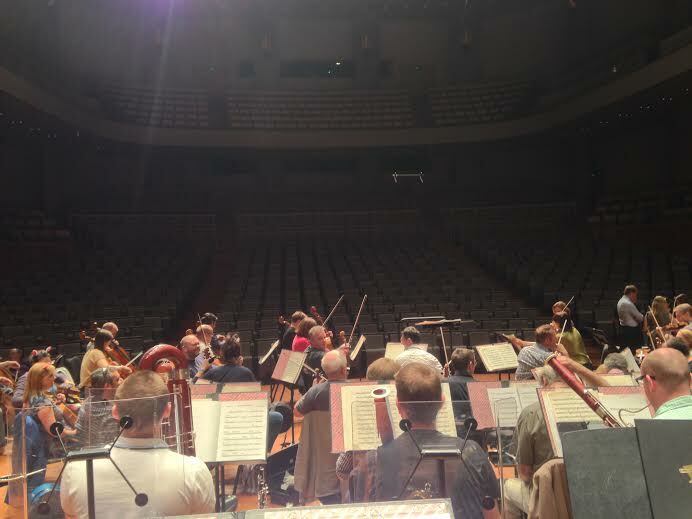 This is the RLPO and Vasily Petrenko rehearsing in The Egg with Chinese megastar tenor Yijie Shi. 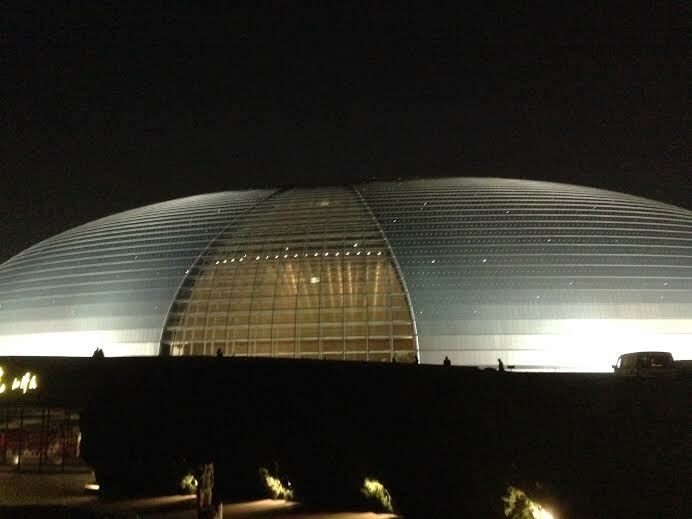 The art work within The Egg was just as impressive as the architecture. Almost as soon as the last note of the performance had been played it was back on the coach and off to the airport for the return journey to the UK. 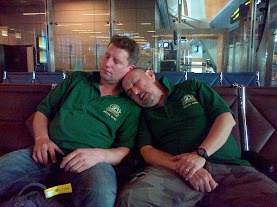 It’s been a long tour for these brass band boys – very smart those T-shirts! 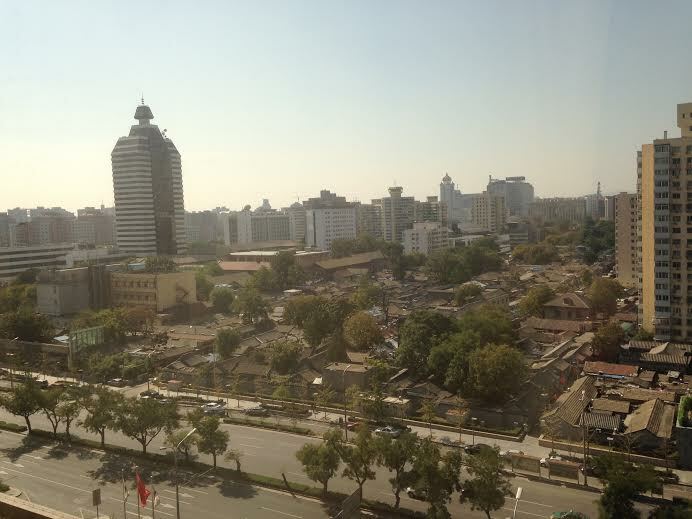 Goodbye China. It’s been a great tour. Unforgettable for so many reasons. 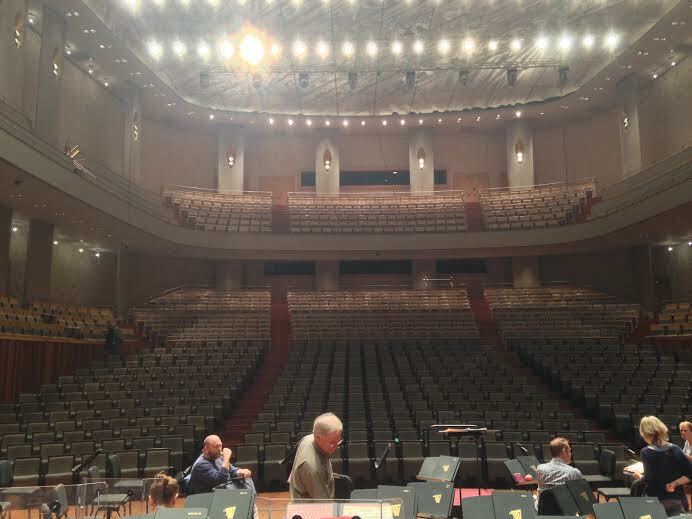 Thank you so much for following my own personal scrapbook of the RLPO China 2014 Tour. Please feel free to comment or share on to others. 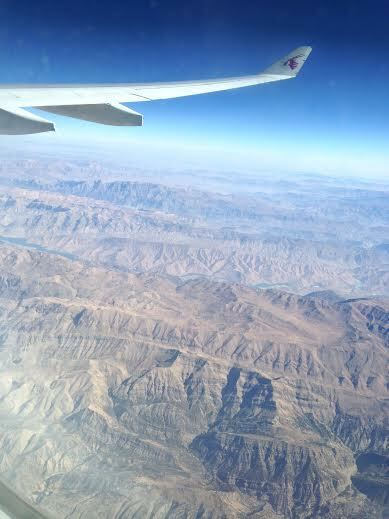 I hope you have enjoyed reading as much as we enjoyed doing the tour. See you in Japan 2015! 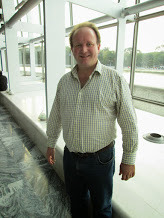 “…Many thanks for following the blog” – Brendan Photo by Morley! 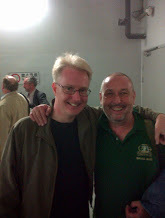 Many thanks again Brendan – I’ve really enjoyed reading your blogs as usual – not long until Japan! Many thanks Brendan, really enjoyed great commentary and pics! Looking forward to the start of the new ‘home’ season!